Ford Motor Co. will announce investments in three of its Michigan manufacturing plants Tuesday morning, according to three sources familiar with the automaker’s plans. The Dearborn-based automaker will announce investments at its Michigan Assembly Plant in Wayne, Flat Rock Assembly Plant and its Romeo Engine Plant, according to the sources who agreed to speak only on the condition of anonymity because they were not authorized to release the information. It is unclear how many jobs will be created, or the total dollar amount. 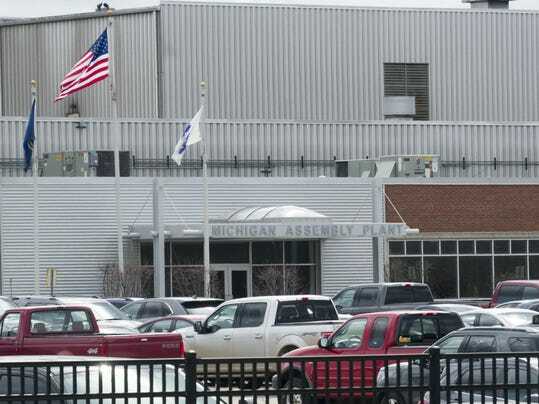 However, one of the sources characterized the investments as “significant.” A promised $700 million investment at the Michigan Assembly Plant was part of the 2015 Ford-United Auto Workers contract. Tuesday’s investment announcement comes less than two weeks after President Donald Trump pushed auto executives for more U.S. jobs and new manufacturing plants in the U.S. during a stop in Ypsilanti Township. Trump hinted then that a big auto industry announcement was coming last week, though it did not appear to happen. It’s unclear if Ford’s announcement is the same news teased by Trump. Ford is on Tuesday’s Michigan Strategic Fund meeting agenda for business growth and investments, and likely will receive state incentives. The automaker plans to invest $9 billion in U.S. facilities through 2019, resulting in 8,500 new or retained jobs, according to the 2015 contract. Besides the $700 million investment at Michigan Assembly for new products — the 2019 Ford Ranger pickup and the all-new Ford Bronco planned for production by 2020 — the contract outlines a $400 million investment planned for Flat Rock for Ford Mustang and Lincoln Continental production, and a $150 million investment at the Romeo Engine plant for engine updates. It is unclear whether Tuesday’s announcements go beyond those plans. The automaker would not comment on the details of the announcement expected Tuesday. The UAW could not be reached for comment. Ford’s announcement will come nearly three months after the company announced cancellation of plans to construct a new $1.6 billion in plant in Mexico to build the Ford Focus. Ford announced in January it would invest $700 million at Flat Rock assembly and create 700 new jobs in Michigan. As part of that investment, Flat Rock will get a new manufacturing innovation center and the factory will be capable of producing electrified and autonomous vehicles, plus the Ford Mustang and Lincoln Continental that it already builds here. Flat Rock will get two new vehicles: an all-electric SUV with an estimated range of 300 miles that will be built at the plant by 2020, and an autonomous hybrid vehicle will debut in 2021. Ford plans to use that self-driving vehicle for ride-hailing or ride-sharing services. Speaking at the American Center for Mobility earlier in March, Trump teased an upcoming auto industry announcement, but did not give details. Trump repeatedly has pushed automakers and other manufacturers to build factories in the U.S.
Analysts expect the Focus will halt production at Michigan Assembly in mid-2018. Over the past several months, several automakers have rolled out investment announcements for U.S. facilities. They include General Motors Co., Fiat Chrysler Automobiles NV, Toyota Motor Corp., Hyundai and Kia. Daniel Howes of The Detroit News contributed.